Welcome to Part II of my series on VMA draft. Over the next several articles I’ll be discussing the key archetypes of VMA draft starting today with the various flavors of White-based aggro. In case you missed the first article in my series you can find it HERE. I introduce some of the key concepts that I will be expanding on today. In most draft formats, the more aggressive your deck is the more likely you want to be heavily invested in one color as opposed to evenly balanced between two colors or even multicolor. The reasons for this are diverse, but they mostly have something to do with the importance of hitting your early plays consistently. 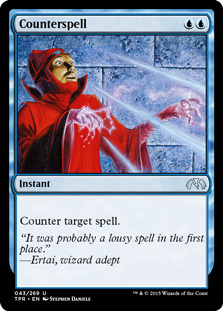 In all but the most multicolor of formats, more powerful cards often have multiple colored mana symbols in their cost. If you want to cast your WW creature on turn two or your 1RR creature on turn three consistently, you need to have lot of lands that produce the relevant color of mana. This concern is less true of expensive creatures. A 3WW creature doesn’t need as many plains because you are much more likely to have drawn that second white by turn 5 then you will by turn three. Hence, control decks (whose power plays come in the mid to late game) can generally be a bit more adaptable to balanced or multicolor manabases. You certainly can build an aggro deck balanced between two colors but it is likely to have a lot higher variance than an aggro deck that is based heavily in one color. If your deck is bad you might want this variance as you can hope to get lucky and win with your best draws, but let's not plan on drafting a bad deck! If your deck is good, you want consistency as your most likely path to a loss is to not be able to cast your spells. These rules apply to VMA more so than most formats for two reasons. One major reason is that two of the three main aggressive archetypes (white and red based) both feature powerful cards that reward being heavily invested in one color. 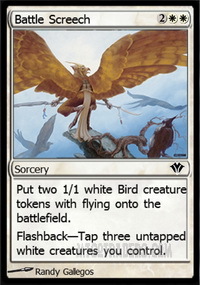 Cards like Pianna, Nomad Captain, Gustcloak Harrier, and Battle Screech all reward you for having a lot of plains and the screech wants you to have lots of white creatures too. On the red side, cards like Goblin General, Goblin Warchief, Beetleback Chief, and Goblin Ringleader all reward you for having lots of mountains, lots of goblins, and often both. You can absolutely draft a WR or RW aggro deck in VMA, but your deck will be much better if you are heavily in one color and only dipping a bit into the other color for certain kinds of spells. The other major reason why going multicolor aggro in VMA is bad is because of the lack of mana fixing. 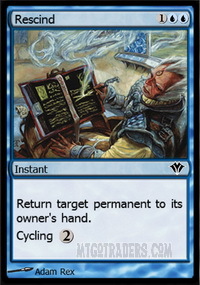 Essentially all of the mana fixing in the format requires you to invest early turns in either lands that come into play tapped or landcycling. This is fine for a controlling or midgame deck but if you are aggressive you want to be curving out with your creatures. Hopefully I’ve sold you on the idea that you should be heavily invested in a single color when drafting an aggressive deck, particularly white or red based aggro in VMA. There are five distinct sub-archetypes to discuss here: monowhite, W/r, W/g, W/u, and W/b. All five decks share the same core concepts, with the most pure expression in monowhite. In each of the splash decks you are basically trying to do the same things as you are with a monowhite deck, only you are adding certain kinds of cards from the support color in order to help your strategy. First I’ll discuss the white shell and then talk about some of the key cards for each of the splash colors. Then we’ll take a look at the strengths and weaknesses of each choice and finally look at the card selection from the point of view of “forks and cornerstones”. The most basic and most important concept for the White aggro deck is non-interaction. Basically, white decks want to act almost like combo decks. If you can create a scenario where what your opponent is doing does not matter because your approach can fundamentally ignore what they are doing, then you are doing your job. 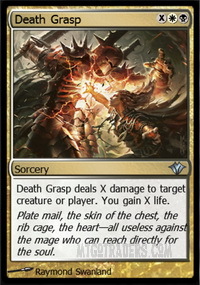 There are three main ways that White aggro tries to accomplish this: shadow creatures, swarming, and protection effects. If you like to draft white, you should get to know these two. In the majority of situations they are simply unblockable, which is exactly what white wants. You drop them early and just keep turning them sideways. Ideally, what your opponent is doing won’t matter because it won’t be fast enough. 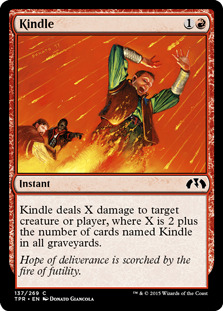 There are removal spells which get these guys -- Kindle, Spark Spray, Expunge and Chain Lightning most notably, but there are plenty of ways to prevent this from happening either by pumping them or protecting them. The only decks that are likely to actually be able to block these guys are other white decks and black decks which have access to Dauthi Mercenary. While you’d rather not trade these creatures away, if your opponent has to block with Dauthi Mercenary then you are at least gaining some tempo. 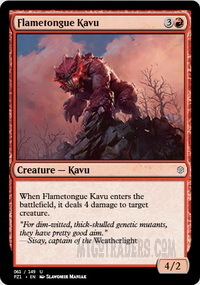 Red does have access to Wall of Diffusion but most red decks have no interest in this card and I’ve rarely seen one in play. Blue has Thalakos Drifters but they are an uncommon, cost four mana, and require a discard to gain shadow. Empyrial Armor is worth discussing here because it works particularly well with the shadow strategy. If you can drop a t2 shadow guy into this on turn 3, your opponent is going to have a bad time unless they remove it immediately. Throw in a t1 Benevolent Bodyguard to protect your investment as there actually are quite a few answers to this combo. 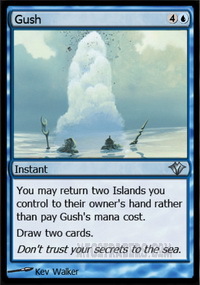 If your opponent is G/W or red and tapped out you are pretty safe, but if you are playing against Islands, Swamps, or untapped Mountains you are at risk of getting blown out. 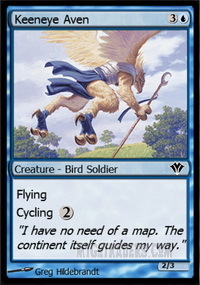 Also, please note that this card DOES NOT give your creature flying, despite the art. It is MUCH worse on a non-evasive creature as many opposing decks will be well set up to chump block until they can find an answer. The problem with Empyrial Armor when compared to, say, Elephant Guide is that it incentivizes you to keep your hand stocked. If you keep playing lands and spells your pants will shrink substantially. On the other hand, if you hold cards to keep your guy huge you open yourself up to losing a ton of tempo if your opponent eventually finds an answer. This is why it’s absolutely critical that you suit up an evasion creature in order to get full value whereas with something like Elephant Guide you’re pretty happy to just put it on any two drop and start swinging. Most people go gaga for Empyrial Armor but I actually don’t like it quite that much. 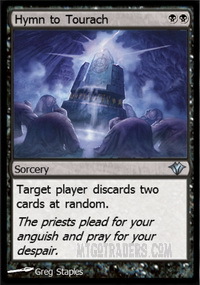 It’s a great card and I’ll be happy to play it every time, but I think a choice between this and, say, Pianna is actually close and I could easily see myself taking Battle Screech over it, especially in the later packs if I don’t have many shadow two drops. 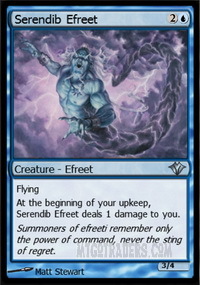 Many have called Battle Screech the best common in the set, and I have a hard time disagreeing with that assessment. Putting four 1/1 fliers on the battlefield on turn 4 is very hard to beat as few colors can interact with this strategy profitably. As I discussed in my previous article there is little mass removal and fliers/reach creatures tend to be slow and clunky. If you can manage to pump your flock with something like Pianna, Nomad Captain or Kongming, Sleeping Dragon then it’s pretty hard to lose. 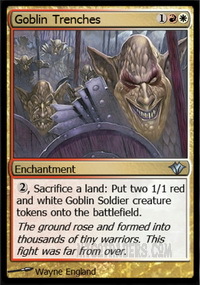 You can also swarm with cards like Goblin Trenches, although that is more of a mid to lategame strategy that nevertheless is good in an aggro deck) or by just putting a lot of bodies on the battlefield. 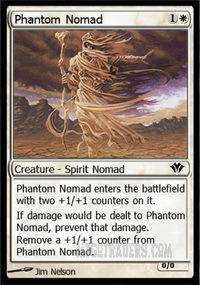 Cards like Gustcloak Harrier and Phantom Nomad are difficult to interact with profitably. With the Harrier you can easily get through the opponent’s defenses by unattacking the ones that get blocked and with the Nomad you can force through damage twice before you lose the card (or more times if you suit him up with something that boosts toughness). White also has access to a couple of tappers in Sidar Jabari and Benalish Trapper that work reasonably well with a swarm strategy. 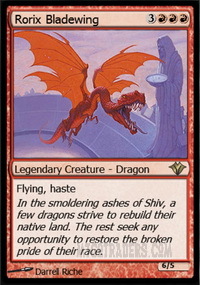 Sidar is especially good as an aggressive card, although he is a bit pricey and you’d rather be hitting screech at four. This little guy is also worth mentioning. He isn’t exactly un-interactive but he functions to limit the effectiveness of your opponent’s strategy while also promoting your general gameplan. He can attack early for a few points and then start provoking your opponent’s blockers and staying alive for only two mana. He can also play defense and block any non-trampling ground guy for the same low price. He helps you swarm the enemy while also making whatever the other guy is doing less effective. He also eats Chainer's Edict like a champ, protecting your more valuable two drops and can even occasionally pick off a Waterfront Bouncer or Nightscape Familiar. Remember this guy when we discuss Wg, as he’ll be even more interesting in that context. 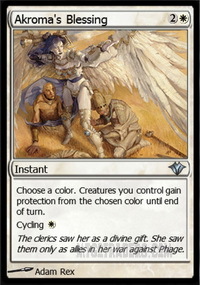 White also has a minor protection theme with the three abovementioned cards. Shelter is nifty but pretty situational. I like the bodyguard a lot better because it’s more proactive. 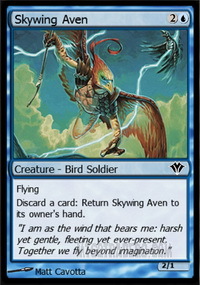 He nicks your opponent early and then protects your more important threats without requiring you to hold up mana. If you are swarming aggressively then he’s not quite as helpful as you aren’t likely to have any cards worth protecting, but if you are on the shadow plan or the pants plan (see Wg later), he can be incredibly demoralizing for your opponent. I can’t tell you how many times I’ve been sitting across from a problematic white threat and hoping to draw an answer only to be totally deflated by a stupid Benevolent Bodyguard. Finding an out is realistic, but finding two outs is much harder. ...etc. These creatures are nothing special but they are good to have. Normally Trapper would be an extremely high pick, but the mana cost to tap can be a problem and you’d rather not be interacting. There are some matchups where Trapper really shines, but most of the time I’d rather have a shadow guy. I’ll pretty much always play him (and in multiples), but he’s not the top pick that he would be in most other formats. So, keeping these three key elements in mind let's take a look at the four other sub-archetypes: Wr, Wg, Wu, and Wb. White splash red is the closest to monowhite in execution, although one does need to be careful when drafting these colors. Like I said before, red based aggro is very good but it relies on a different set of cards from white based aggro. Beetleback Chief is a LOT worse in a white based deck, and Battle Screech is a lot worse in a red based deck. You need to decide which color you are focusing on and prioritize effectively as the last thing you want is to end up with a 9/8 manabase and a bunch of double colored costs in conflicting colors. The most obvious attraction to red is the burn. All of these spells are great because they can get blockers out of the way or go to the dome to finish your opponent. This second, non-interactive option is what makes them synergize especially well with white. Beware of Fireblast though -- that card is SO good in red based aggro, but you really don’t want to run enough mountains to play it in your white decks. I often end up with one of these in my sideboard as I take it early thinking I may go base-red only to end up in base-white. Knowing when to use these cards for what purpose is a key skill. Remember, as the white deck you don’t really want to interact with your opponent if you don’t have to. Ideally, you can ignore what he or she is doing. Consider the following situation: you have two shadow creatures in play and your opponent has just cast something like a Gustcloak Harrier or a Fledgling Djinn. You are holding a Chain Lightning. What do you do? 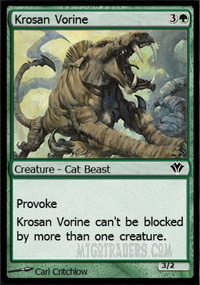 Many players would instantly burn the creature away because this typically a good use of a burn spell. However, in this case it may not be the correct line. Your shadow creatures care about neither birds nor djinns. If you think you are likely to win the race it’s better to hold onto that burn spell and direct it at your opponent’s face later on if you can, or to use it on a relevant blocker later if necessary. If you think that you have a reasonable chance of losing the race, then go ahead and burn your opponent’s creature. Correctly predicting the likely course of the game is a skill that takes time and practice to develop, but it will make a huge difference in your ability to choose the correct lines of play and use your cards efficiently. 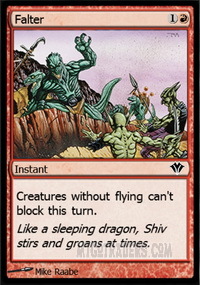 In game 1 where you have less information about the opponent, the conservative line is usually to burn the creature unless you have an overwhelmingly fast draw. 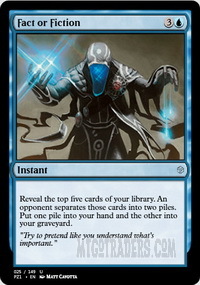 Once you know more about what your opponent is trying to do, however, the correct play will often be to hold the burn spell. Consider the following scenario. It’s game 1 and I’m on the play. My draw develops over the first few turns with a turn two Soltari Trooper, a turn three Soltari Emissary, and a turn four Battle Screech. I also have a Chain Lightning in hand. Let's say that my opponent plays a turn two creature such as Hulking Goblin, Fledgling Djinn, (Skirk Drill-Sergeant), Fallen Askari, or Benalish Trapper. 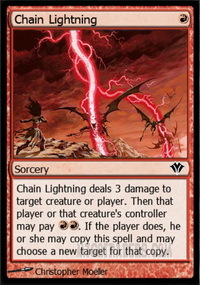 Most players would probably snap burn the creature on turn 3 with the Chain Lightning. I might hold it though as my draw is so fast that there is very little chance that my opponent will be able to match it. 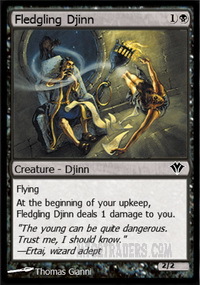 The only realistic out my opponent has is a card like Famine, and in that case I’d rather hold the bolt for afterward as his creature is just going to die anyway. If my draw was not so good -- say just the two drop and the Battle Screech along with the Chain Lightning, then I might burn the creature because there are many more realistic scenarios that would lead to a loss. If they kill my two drop, for example, then the Battle Screech suddenly doesn’t look so good and I might get overrun. 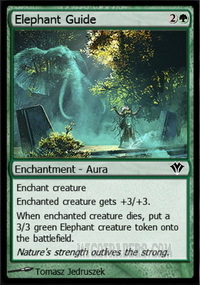 I also might not be able to race a two drop into Elephant Guide, so preventing that possibility becomes more attractive. As you get more practice with Wr, you will get better and better at making these decisions effectively. This card is absurd. It’s not really an aggro card, but it helps you win games that you otherwise couldn’t win. 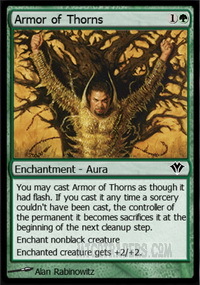 One of the ways that aggro decks lose is by flooding out, and trenches provide an excellent solution to that situation. Sometimes you get stalled and can’t get the last few points through -- say your opponent gets a couple of blockers down and kills your shadow guy. Saccing two or three lands to trenches on turn 4-6 will likely give you enough bodies to get through for the last points. There is no real nuance to playing this card well. Rites is another great card that helps with the swarm strategy. 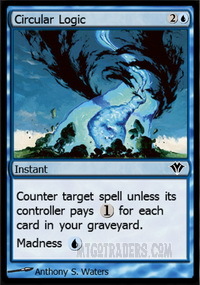 Keep in mind that it’s very swingy -- you can often win out of nowhere, but you also can be very vulnerable to a counterspell so keep that in mind when playing against blue. FTK and his weaker cousin are both good cards, particularly in the white mirror. A timely 187 can really swing the game in your favor. Sometimes you can’t completely ignore your opponent and these cards do a good job of providing some interaction while still advancing your game plan of putting bodies on the board. Don’t overdo it on commandos though as they do cost five mana, and beware getting a glut at four with FTK as white has a lot of attractive four drops. Stay away from cards like these. 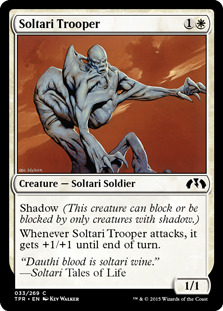 (Scourge of the Throne as well as Rorix). They may look sweet but they are slow and hard to cast in your white deck. Just because you are playing mountains does not mean you should play dragons. If you drafted correctly, your white deck does not want this card as most of your creatures already can’t be blocked easily. 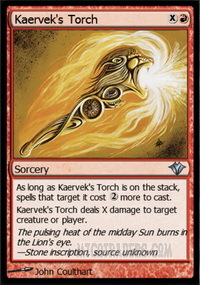 Red adds an extra dimension to the deck through access to burn, although playing the burn optimally can be a challenge. The only real weakness is a loss of consistency as you shift away from a monocolor mana base. Adding red to white, as long as you don’t overdo it, does not add any major new vulnerabilities to your strategy. 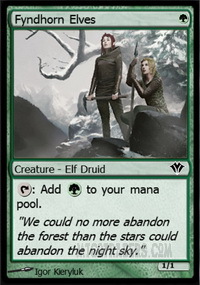 Green is another good choice for pairing with white, although the W/g archetype is very straightforward. There isn’t nearly as much to talk about here as there is with red, and that is mainly due to the fact that green really only provides one thing to the white deck: PANTS. All three of these cards are great in the white aggro archetype, and they are especially suited to be paired with shadow creatures and Deftblade Elite. A two drop into Elephant Guide will win most games. The other fat suits are not quite as strong as Elephant Guide mainly because they carry an additional risk of card disadvantage, but having a turn one Benevolent Bodyguard can go a long way toward making you safe. 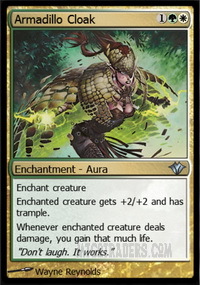 Without protection, even Elephant Guide is vulnerable to bounce but the rest also get blown out by Expunge and Afterlife as well as sometimes Chainer's Edict and Chain Lightning. 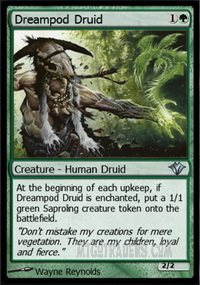 The druid is a natural fit for W/g as it provides a turn two beater and an excellent target for your auras. I don’t like that it skews your mana base a bit more toward green, but it does have the advantage of immediately protecting itself from Chainer's Edict. This card was underrated for a long time and might still be. It’s very hard to lose when you suit this guy up quickly and it goes very well with your other swarm cards. I have mixed feelings about these two cards. They both are expensive at five mana and both cost double green. They do fit well with the swarm theme, but you are unlikely to get the full potential out of them (particularly Grizzly Fate). I will still take and play these in Wg but I don’t take them nearly as highly as I would in UG. This is another very strong green two drop that I’ll be happy to play but won’t be taking as highly as the UG drafters will. 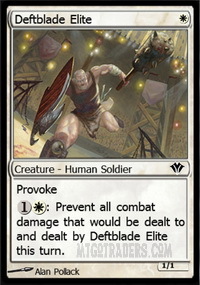 I’d rather this be a Soltari Trooper if my deck is good. It’s incredibly powerful, but remember that we want to be heavy white and want white creatures to help with Battle Screech. 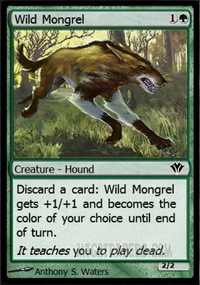 I suppose you can turn the mongrel white, but you don’t really want to be doing that if you can help it. 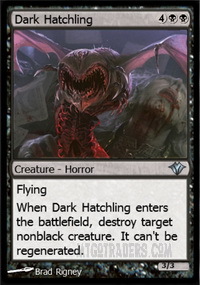 Again, this is a fine card but it will be much better in bad Wg decks than the good ones that are heavily white. I’m rarely going to be happy to play this in a W/g deck. Normally this is a premium green card but don’t be fooled -- in this archetype it’s chaff. You want to be playing a white creature on turn one if you can, and you don’t want to be playing enough forests to make this good. Plus, what are you accelerating into anyway? Your best turn 3 plays -- cards like Pianna, Nomad Captain and Gustcloak Harrier cost double white and are therefore uncastable off this guy t2 unless you have a Savannah. Here is another card that you’d think would be awesome but isn’t. He’s fine -- I’ll begrudgingly play him -- but he isn’t what you want. You don’t want to be putting your aura down turn 5 -- you want it on turn 3. Without an aura the vorine is badly overcosted and does nothing to further our plan of not interacting with the opponent. Overall Wg is a very straightforward archetype that is going to take the same cards as the white core plus nice green auras to beef up your evasion men. 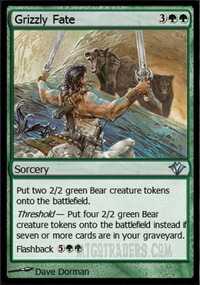 The great thing about this is that the other green decks are generally going to be taking other cards (like Wild Mongrel) over cards like Elephant Guide. 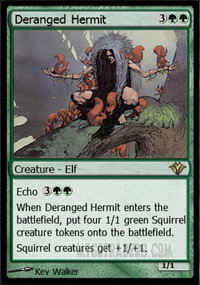 Thus even if you are behind a UG Madness drafter you can still often get the cards you want the most out of green. Versus Mono-white, Wg sacrifices some consistency for the raw power of t2 shadow creature into t3 pants. The biggest challenge in this archetype is knowing how to properly prioritize the green cards, as the usual premium spells are not actually the ones you want. All three of these cards go nicely with white as they get your attackers through and prevent your opponent from having any hope of racing. 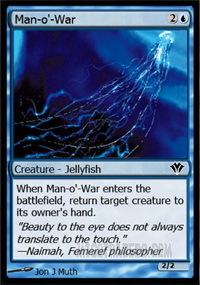 Man-o'-War is especially good as it adds a body to the board. Repel is slightly worse here as you tend to have good four drops already in white, but it’s still good. The cheap blue fliers work well with the white strategy of avoiding combat, although I generally would prefer white creatures. You can’t always get what you want though, and these men can be a nice consolation prize. The one exception to this is Serendib Efreet who is super-efficient and a high pick. These cards are fine, but not really where you want to be as again you want to be heavy white and you aren’t likely filling your graveyard much. All three are strong cards but you’d rather be playing creatures and bashing. I’ll run them but I won’t be happy about it. The best of these is likely Gush as it can be cast alongside a creature or bounce spell. Adding blue to your base white deck improves some matchups and makes other worse. Against decks that can actually outrace you, the blue cards can be a huge boon. Against decks that are more controlling though and are trying to stop you with spells rather than creatures (or trying to combo off), blue becomes a liability. All of your bounce and tempo plays do very little if they aren’t playing creatures that you need to interact with. Sometimes decks like these can tempt you into poor sideboarding plans too such as sideboarding in reactive cards like counterspells. Yes, counters can be nice but drawing them instead of creatures will slow down your clock enough to give the combo player a big edge. Don’t fall into this trap unless you are confident your opponent just can’t beat a counter. This is where things really start to get murky. If you continue to extrapolate based on the logic of previous white-based decks, you’d expect W/b to be a deck that mostly just uses black for removal and continues to beat down with white dorks. Such an assessment isn’t entirely inaccurate -- you can very well build a W/b beatdown deck with a white creature base and a few copies of Chainer's Edict or Expunge. The problem is that this is pretty much just plain worse than the W/r and W/u options. 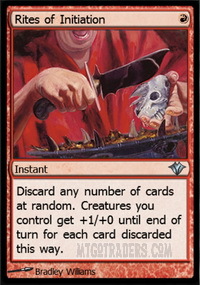 In red, your removal can go to the face. 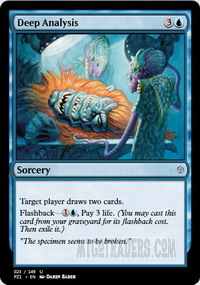 In blue, your removal is temporary but in some cases it adds to the board and in other cases it can deal with multiple creatures (Choking Tethers). In black it’s pretty much just durdly one-for-ones. Creatures like these beat down harder and faster than the white creatures do. The problem is that they also eat your life total and the ground guys don’t play well into the idea of avoiding interaction. The real problem with these creatures, however, is that in order to reliably hit black on turn one or two you need to be playing a fair number of swamps, which in turn does not combine well with a heavy white commitment. This guy plays very well with the white shadow creatures and only costs a single black, which is much more palatable on turn three. He isn’t as good as he is in a black based aggro deck, but I will never be sad to include him in a W/b deck either. These cards would be great in a W/b aggro strategy if it weren’t for the high mana cost and double color commitment to the wrong color. I don’t hate running them but they aren’t optimal either unless you are running a bit slower of a deck with a more balanced color commitment. This card, however, is perfect. It swings races, kills problematic creatures, and wins games. In my opinion, Death Grasp is the biggest reason to go W/b. 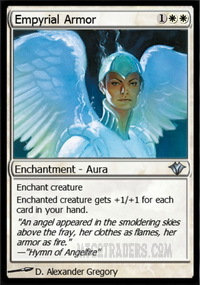 Of the four sub-archetypes of white aggro I like W/b the least. The removal isn’t that helpful, the creatures mostly aren’t ideal for a heavy white deck and the marquee cards are double black. 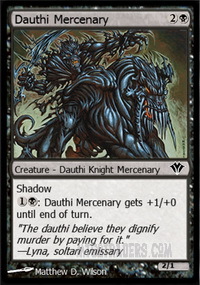 Death Grasp and, to a lesser extent, Dauthi Mercenary are the main exceptions. 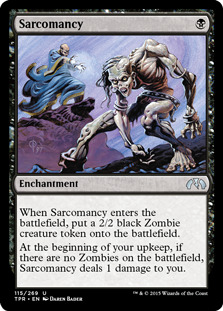 Black will tempt you into a 9/8 mana base more than any other color to pair with white, and generally I think this is a bad idea. Your deck will be much less consistent for only a small gain in power. My concept of Forks and Cornerstones breaks down a little bit with White aggro because the cornerstone cards are generally highly sought after. Battle Screech is the best example of this. No deck other than white aggro really wants this card, but because White aggro is probably the best deck in the format and Battle Screech is the best common in that archetype it goes very early. The only real cornerstone that you can count on getting late(ish) is Gustcloak Harrier, although you can also often pick up Benevolent Bodyguard and Deftblade Elite on the later side as well. Straight up white aggro doesn’t really fork well into other archetypes either as the best white cards are all heavy white. If you take an early Battle Screech or Pianna, Nomad Captain you are probably only going to be happy playing them if you end up in an aggressive white deck. That said, the most powerful support cards from the four other colors do fork well as they are all in demand for other archetypes. Chain Lightning, Kindle, Kaervek's Torch, Solar Blast, Flametongue Kavu, Goblin Commando, Man-o'-War, Choking Tethers, Wild Mongrel, Dreampod Druid, Elephant Guide, Expunge, Chainer's Edict, and Dauthi Mercenary are all relatively reasonable fork cards that you can play in a heavily white aggro deck but can also lead you down a different path if white isn’t open. The problem is that you really don’t want to take one of these over a premium white card because you will almost certainly send your neighbor(s) downstream into white. 1. If there is a premium card for white aggro p1p1 take it, but be prepared to jump ship if it isn’t open. 2. If there is no premium card for white aggro, take one of the fork cards from a support color and then figure out over the next few picks if white is open. If it is, jump in. If it isn’t, go in a different direction with your fork or abandon it altogether. 3. If neither option is present, take a powerful card for another archetype that you like but be prepared to jump over to white aggro if you see a clear signal to do so. You have to be decisive though because if you vacillate you will probably ruin your deck. Note that I don’t generally buy into this concept, but when you are trying to draft an extremely popular archetype like white based aggro you can’t afford to give people around you a reason to compete with you for cards. Certain cards are much lower picks than they usually are, such as Benalish Trapper and Exile. Adjust accordingly. Pay attention to your mana curve. It’s easy to get a glut at 4. I’ll still play as many Battle Screech as I can though!